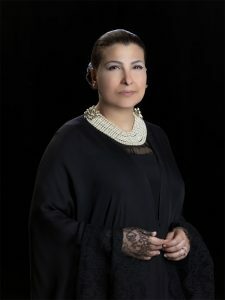 Huda I. Alkhamis-Kanoo is a philanthropist who has dedicated her life to inspiring artists to create, generations to innovate and communities to unite and prosper. 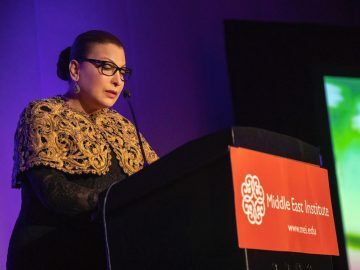 She worked tirelessly to found the Abu Dhabi Music and Arts Foundation (ADMAF) in 1996 and is also the Artistic Director of the jewel in its crown, the Abu Dhabi Festival, which she established in 2004. Huda I. Alkhamis-Kanoo’s unquantifiable contribution to the UAE’s national cultural sector was recognised by H.H. President Sheikh Khalifa bin Zayed Al Nahyan in 2006. 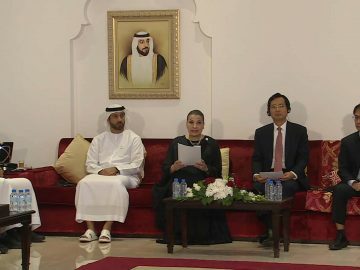 He appointed her to the Board of the Abu Dhabi Authority for Culture & Heritage (now Tourism & Culture Authority Abu Dhabi), on which she served until 2012. 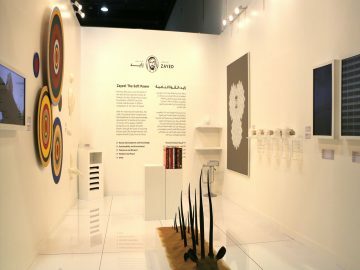 For Huda’s dedication to the arts, education and women’s development, she has received numerous awards and commendations, including The Abu Dhabi Award & Abu Dhabi Medal (conferred by H.H. General Sheikh Mohammed bin Zayed Al Nahyan, Crown Prince of Abu Dhabi), Women Together Award (a UN-affiliated NGO), Puccini Festival Foundation Award, the Aspen Institute Emerging Voice Award for Cultural Stewardship, The Medal of Civil Merit of Spain, Commander of the Royal Order of Isabella the Catholic, the Bundesverdienstkreuz of Germany, Commendatore dell’ Ordine della Stella della Solidarietà of Italy, Chevalier de l’Ordre des Arts et des Lettres of France, the Belgian Officer of the Order of the Crown, The Gloria Artis Medal of Poland, The Order of the British Empire, The Commander of the Royal Order of Isabella the Catholic (Orden de Isabel la Católica), an honorary doctorate from the American University of Paris, Chevalier de l’Ordre National de la Légion d’Honneur of France and the Middle East Institute’s Visionary Award. 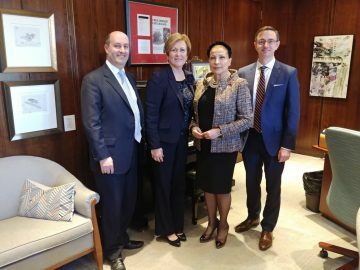 She is a Board Member of Lang Lang International Music Foundation and spearheads a range of initiatives concerning issues close to her heart. 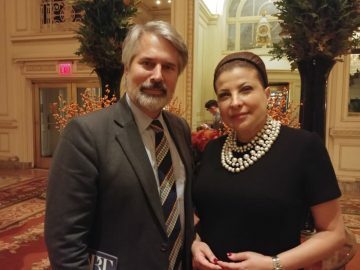 She is a member of the Cleveland Clinic International Leadership Board, the Advisory Council of the Arab Fund for Arts & Culture, the International Circle of the Reina Sofía College of Music and the International Advisory Board of the Edinburgh International Festival. She also sits on the National Advisory Council of Zayed University – College of Arts and Creative Enterprises, and is an Advisor to the Board of Directors of Ewa’a Shelters for Women & Children, an Abu Dhabi-based organisation that supports victims of human trafficking. The daughter of a pioneering Saudi businessman and a Syrian mother, Huda was born in Beirut, Lebanon. Raised at a crossroads of cultures, her education took her to the American College of Paris, where she read French Literature and Art History before returning to the region and settling in Abu Dhabi. 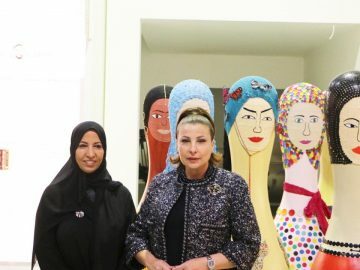 She is married to businessman and artist Mohamed Abdul Latif Kanoo, a member of the prominent business family of the Kingdom of Bahrain, with whom she has three children: Abdul Latif, Noor and Abdul Rahman. H.E. 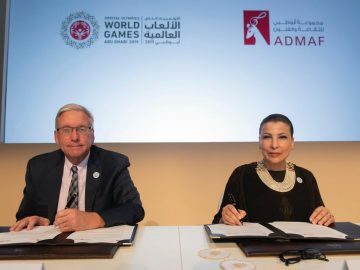 Huda I. Alkhamis-Kanoo, Founder of ADMAF and Artistic Director of the Abu Dhabi Festival, and Peter Wheeler, CEO, Special Olympics World Games Abu Dhabi, signed a Letter of Cooperation during the Abu Dhabi Festival 2019 Press Conference. On November 2, 2018, ADMAF founder, H.E. 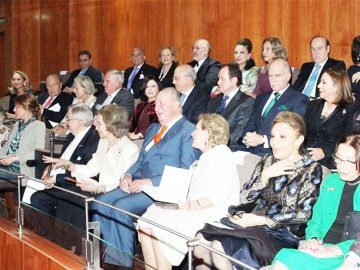 Huda I. Alkhamis-Kanoo, attended the Reina Sofia School of Music for the celebration of the 80th birthday of Her Majesty Queen Sofia, which took place in Madrid.